This hot potato salad recipe is not your usual potato salad -- that which uses mayonnaise and sour creme mixed in the boiled potatoes. I got the idea when we dined out at a restaurant in Quezon City, and we were served with this amazing salad that was so creamy and cheesy. The salad was so rich and delicious that I thought it couldn't be made just with mayonnaise. That's when I decided to use my sister's bechamel sauce recipe and add lots of cheese, just like in her lasagna recipe. Though this is more like baked potato than a salad, I guess it can go either way. I like to pair this with roasted chicken, steak or barbecue as a side dish, served either hot or cold. 1 Peel the potatoes and cut in quarters. Boil them until soft but still firm. Strain, then set aside. 2 In a separate pan, fry the bacon until golden brown and crispy and chop in bits. 3 Remove most of the bacon grease, leaving only about 2 tablespoons in the pan. 4 With medium low heat, melt the butter in the oil, then add the flour and stir continuously for about a minute. 5 Mix in the milk and water and stir until flour is fully dissolved. 6 Melt 3/4 of the grated cheese into the sauce and season with salt and pepper. 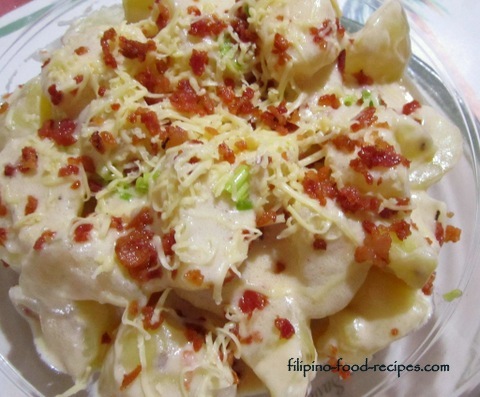 7 Mix the sauce with the potatoes and top with the bacon bits, green onion and the remaining grated cheese.